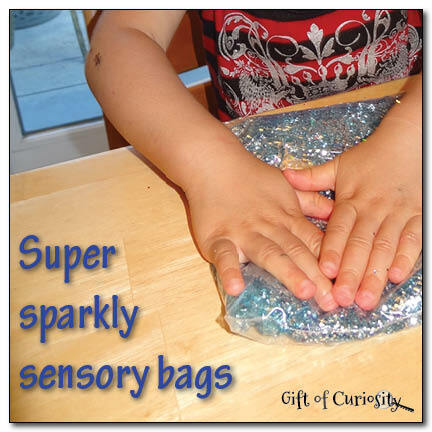 Sensory bags are such a fun, easy way to keep my kids entertained for an afternoon. 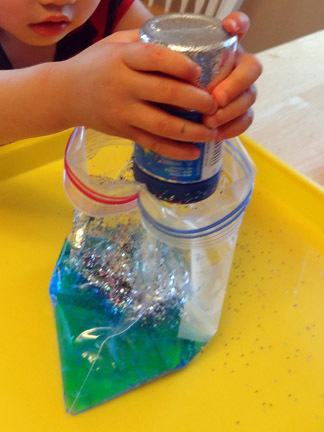 So knowing that glitter makes everything more fun, the kids and I recently created our own super sparkly sensory bags. These bags were a huge hit with my kids. And I love that they provide some pretty mess-free fun! 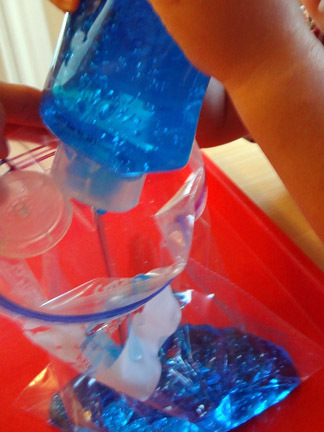 Note: This and other sensory play ideas can be found on my sensory play page. 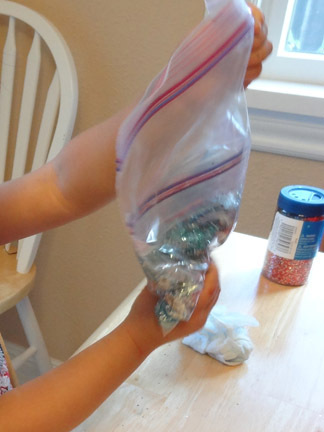 For this particular activity, I gathered up some quart sized freezer bags, blue hair gel from the dollar store, glitter, and two kinds of beads. 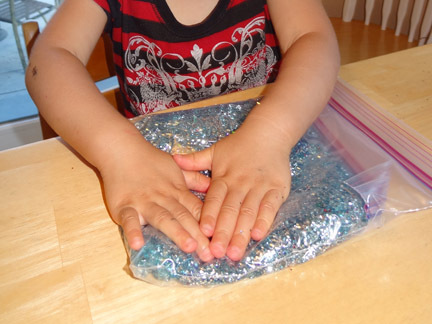 I invited the kids to help squeeze the gel into the bags. They always get such a kick out of getting to do this. 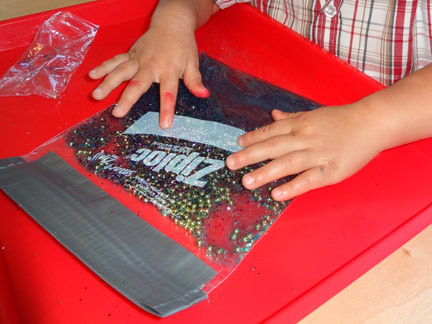 Then each kid chose some glitter to put in their bags as well. They added a lot of glitter, making these bags super sparkly. 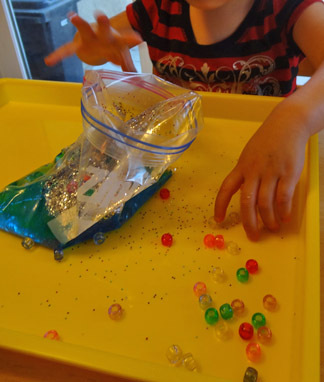 Next, I gave them a choice of beads to put into their bags in order to add an additional sensory dimension to their bags. QBoy chose some tiny gold beads for his bag, while XGirl chose some colored plastic beads for her bag. After all the materials were added, I added a “layer of security” to prevent the bags from opening and leaking. I used duct tape to seal the top of QBoy’s bag and put XGirl’s bag inside a second bag. 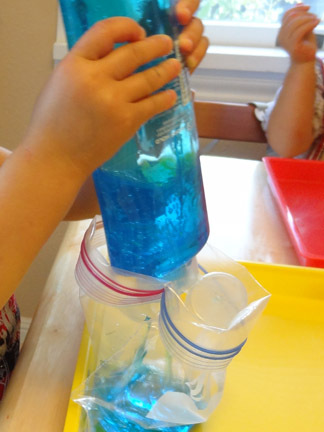 Once the bags were sealed, the kids began to explore different ways to play with them. They squished the gel around the bag. They picked them up and squeezed them. They laid them down and used their fingers to feel the beads inside. 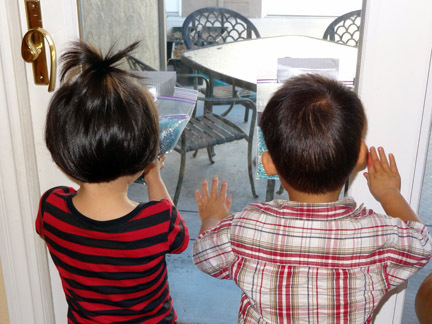 And when the kids were done playing with them at the table, I taped them to the back door so they could continue to play with them for the next several days. 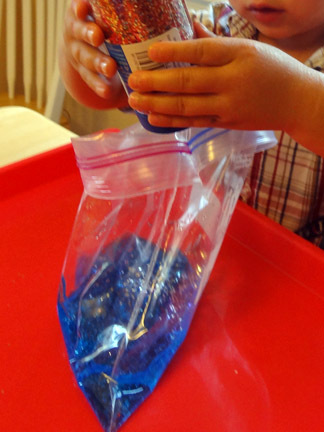 Love that you used hair gel, I bet these bags are super fun to mush (and my girls would love to squirt the gel in the bag too! Thanks for sharing on We Made That! Love your blog, just found you from a linky. A tip I got from another blog to get the printing off of a plastic bag is to moisten a cloth or paper towel with nail polish remover and the printing comes right off. Great tip, I will have to try that! Thanks! Oh, what fun!! We may have to make one of those. Thank you for sharing at Sharing Saturday! !